Mermaid 2 is a twin-engine, steel-hull diving yacht, purpose built to take up to 18 guests. The boat is large & well-designed to withstand all sea conditions expected travelling between some of the best diving sites in the world. 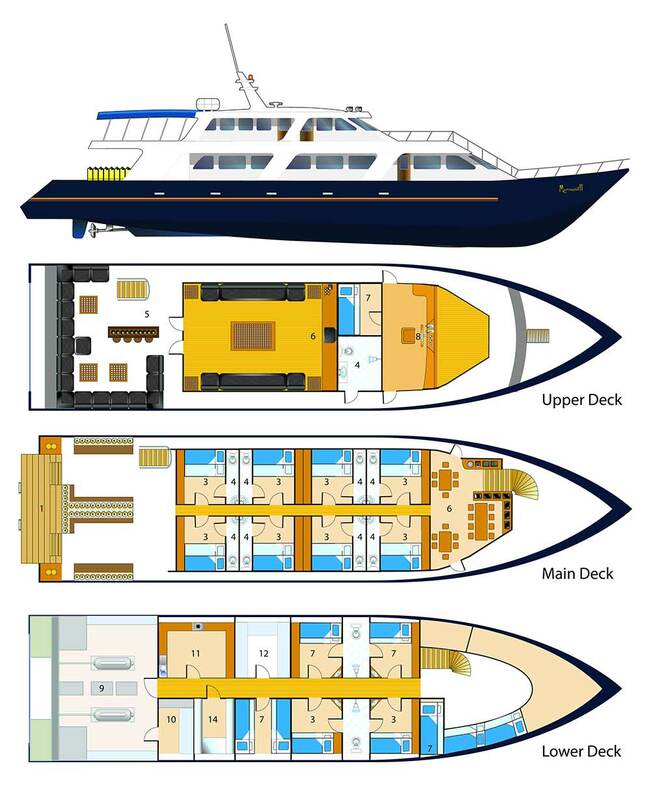 At 33 metres in length, and 7 metres wide, Mermaid 2 offers both comfort & stability throughout each diving cruise. Luxury is guaranteed, but the prices are lower than many may expect. 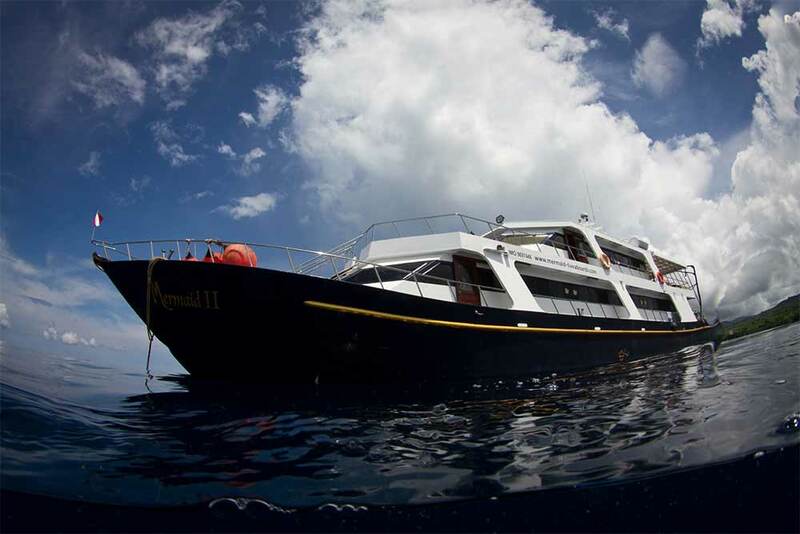 Guests aboard Mermaid 2 come to dive in the diverse tropical seas of Indonesia. 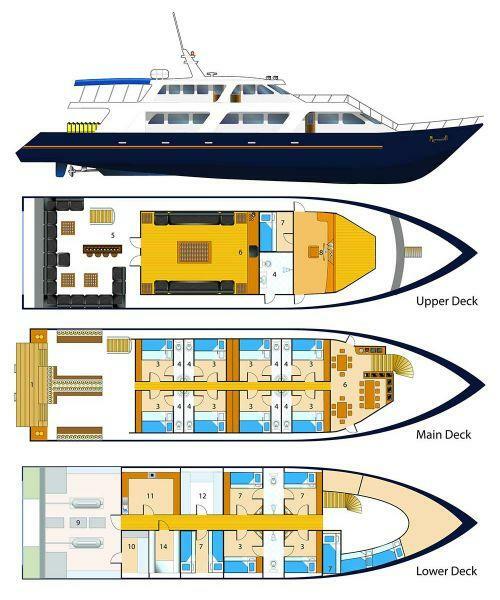 The diving is among the best in the world, and the boat’s size, design & facilities enable all divers on board to enjoy cruises in comfort and with convenience. The huge diving platform allows everyone to have their own space & move around, and to enter & exit the water easily and safely. The deck hands are experienced and service minded. 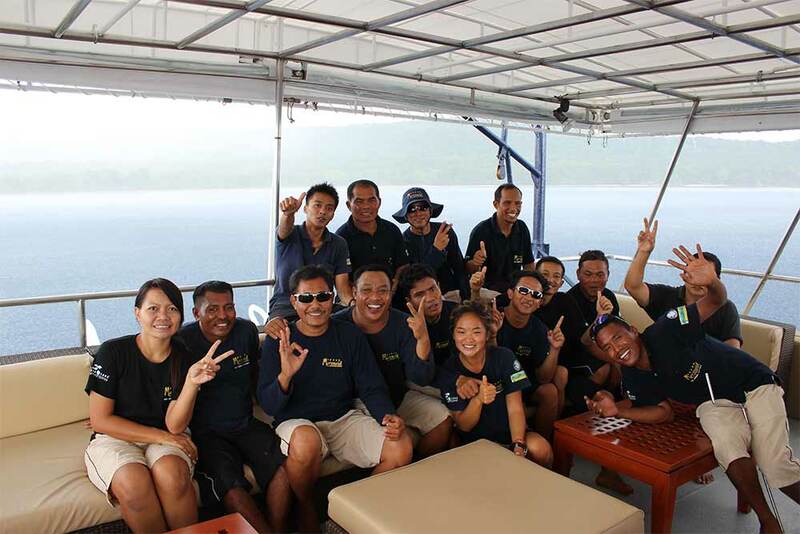 The diving staff know the dive sites well and can find and point out all kinds of marine life for guests. Everything is done with safety, professionalism, and friendly service in mind. At some dive sites the also allow unguided buddy diving, but only for experienced divers. On board, there are double and twin cabins for up to 18 lucky guests. 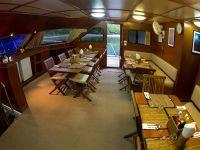 Most cabins are on the main deck and have en suite bathrooms & large windows. 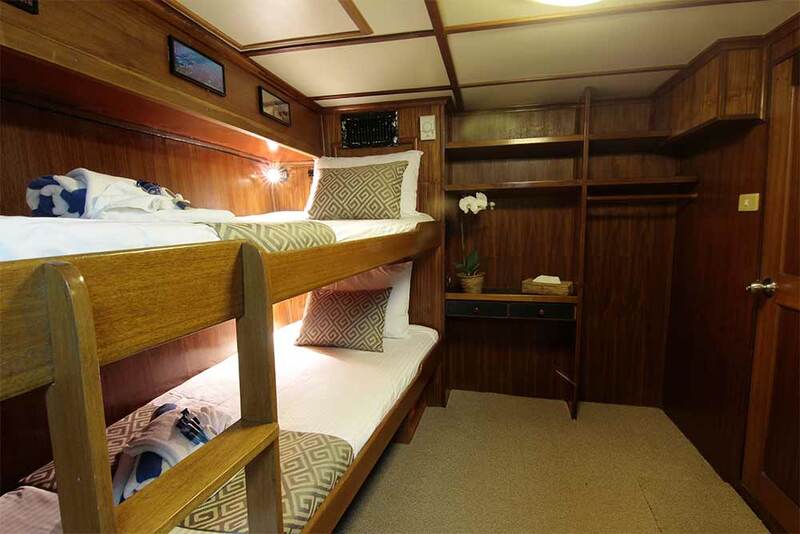 The deluxe cabins have a double bed and a (removable) single bunk above it, but only two guests may book per cabin. 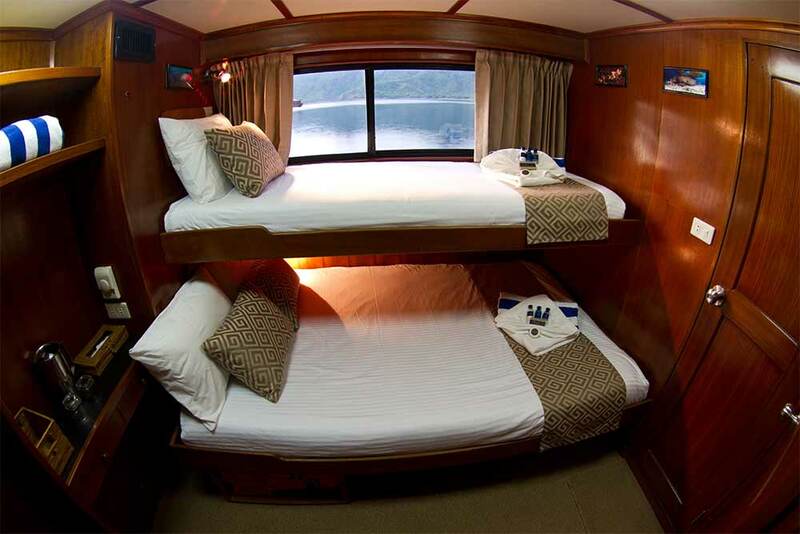 The budget cabin is in the lower deck sharew a guest-only bathroom. 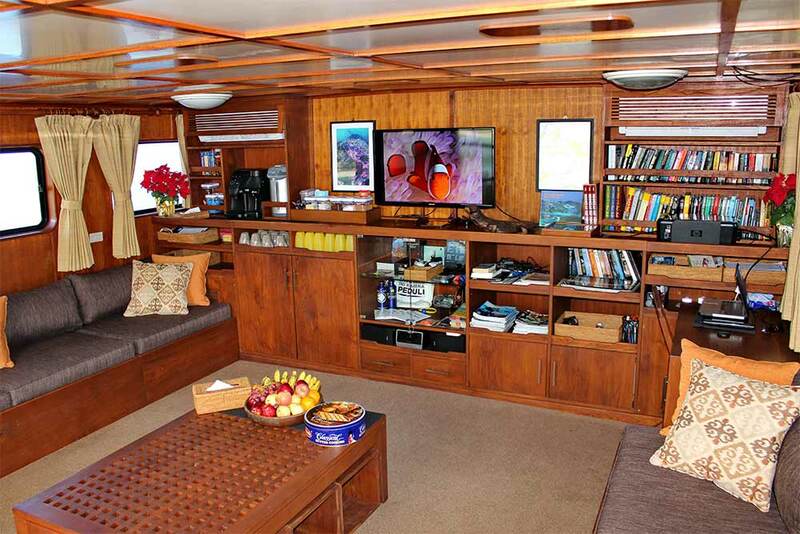 All cabins on Mermaid 2 are air conditioned, very comfortable & cleaned daily. There is an air-conditioned lounge, and several areas (both shaded and exposed) to relax and socialize outside. Delicious meals are served throughout the day, and consist of local and western cuisine. 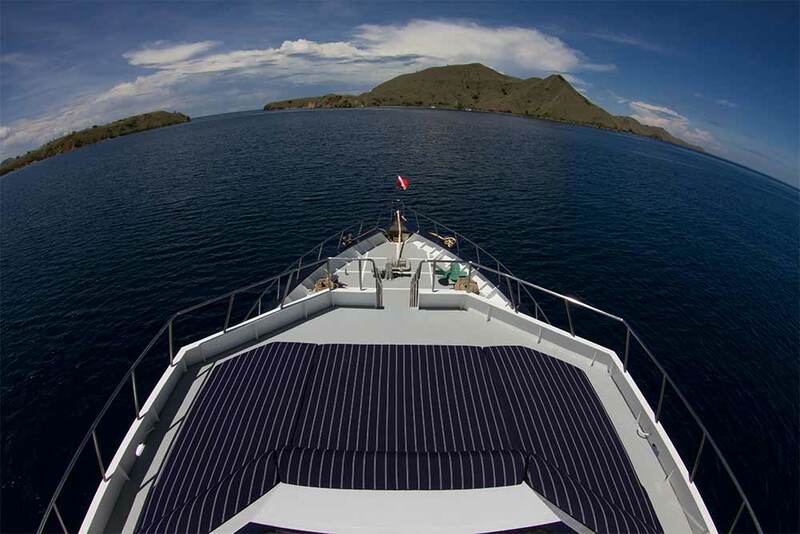 Diving on an Indonesian liveaboard cruise doesn’t need to be a compromise. 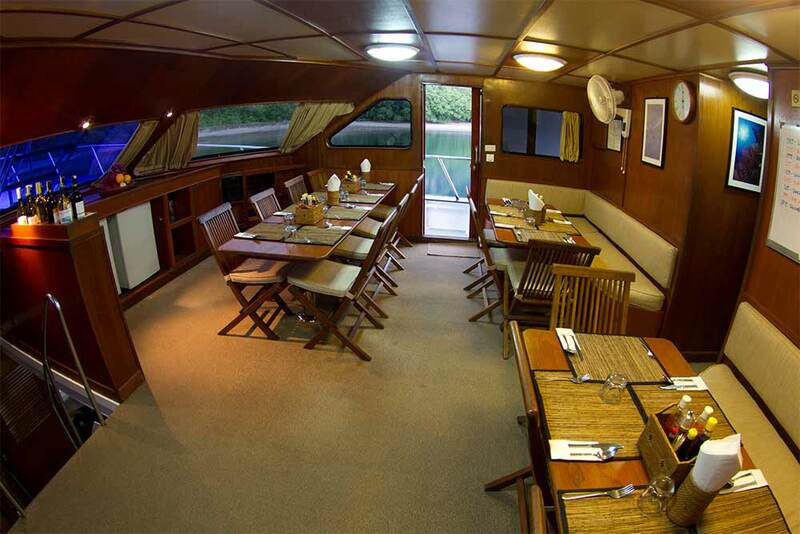 There is no need to suffer cramped conditions on a locally-designed or converted Phinisi boat. 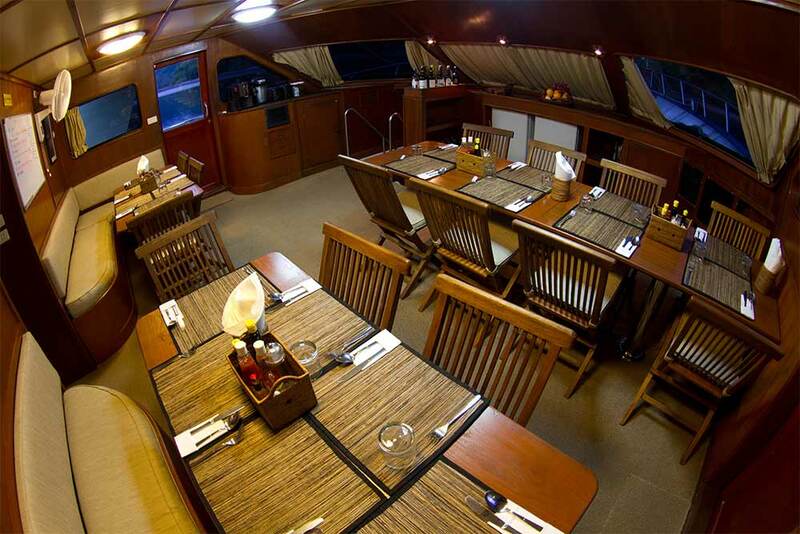 Comfort, safety, and convenience are guaranteed aboard one of Indonesia’s most-respected liveaboard diving boats. 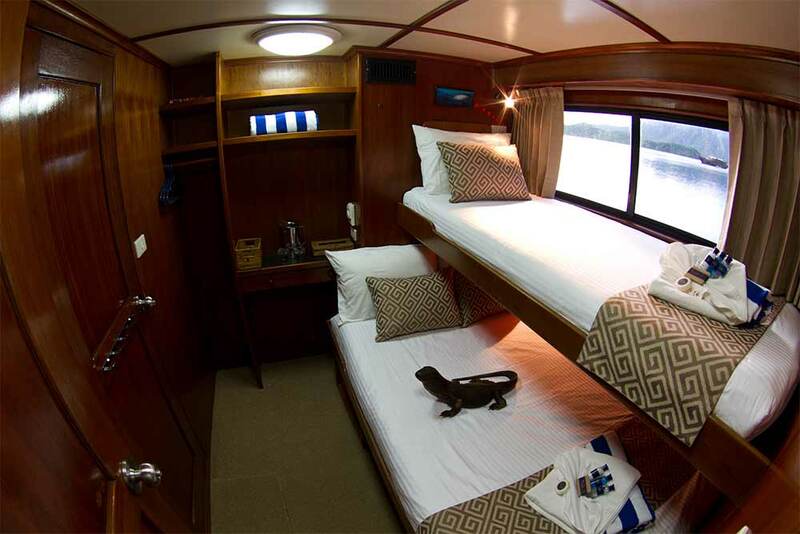 Mermaid 2 was given a full renovation in 2018, meaning that the deluxe cabins' single beds can be removed to give more space. The cabins also have independent air-conditioners and restyled bathrooms. Mermaid 2 has several itineraries, so please choose carefully from the list below. 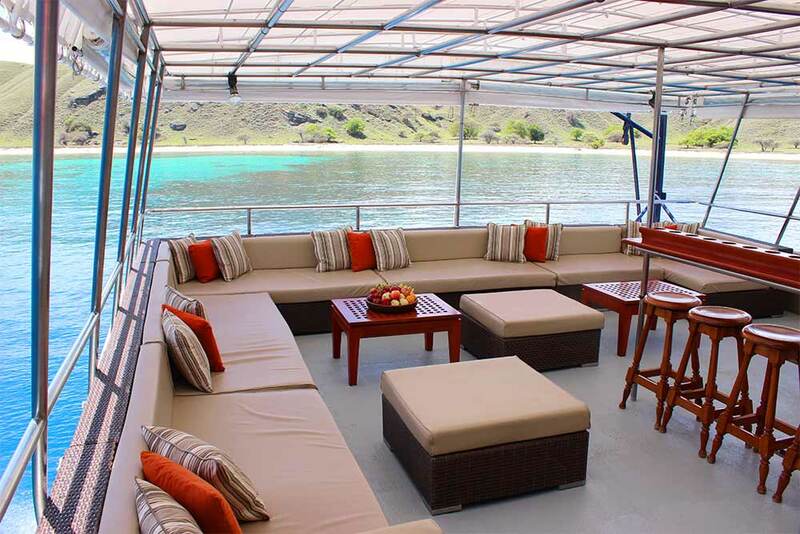 At the beginning and end of the Komodo season, trips may start or end in Maumere, instead of Bali. 'Crossing trips' go in two directions. That means that the destinations are the same, but the order is reversed. Please check the departure and return locations on the schedule. Dives are 'guided' by professional staff, but in some cases it's possible to dive just with your buddy. All divers must use a dive computer on Mermaid 2. Most guests who join Mermaid 2 diving cruises around Indonesia are already certified and experienced divers, but there is always an experienced instructor on board. Diving courses are popular on liveaboard trips, and it's the best time and place to do one. Open Water divers want to become ‘Advanced,’ to take advantage of the great visibility down to 30 metres or more. Advanced divers want to extend their bottom times or reduce tiredness, and go for the Enriched Air Nitrox course. Almost anything is possible with a little advance notice. If you are interested in taking part in a diving course on board Mermaid 2, please let us know as soon as possible, and it’s likely that we will be able to accommodate your request, and usually in the language of your choice. Please give us as much advance notice as possible about any diving courses you are interested in. This enables us to give the best information and advice, and prepare the materials and staff. Boarding time at Benoa Passenger Pier at Benoa Harbour Bali is between 13:00-15:00 hours for our 16:00 departure. Final cruise departure time is subject to guest arrival times. Please liaise with Mermaid Liveaboards if your flight times cannot fit this schedule. Transfers from/to the airport or hotels in the south are free of charge. From destinations in central and northern Bali, there is a small charge. Please refer to the price list. 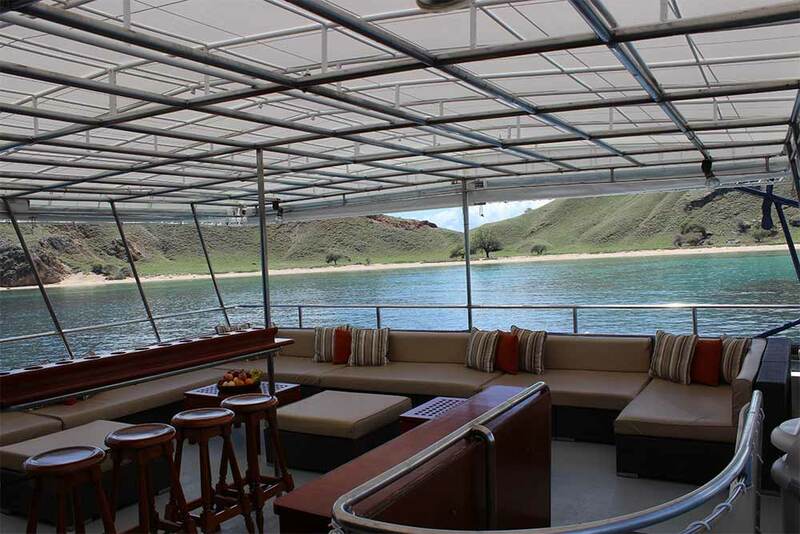 Guests arriving before 12 noon on departure day will be transferred to Mermaid Liveaboards guest lounge at All 4 Diving at Sanur Beach where luggage can be left in safety until boarding transfer at 2pm. 12:30 – Nusa Dua, Ullawatu, Canggu, Kerobokan, 13:00 Jimbaran, Seminyak. 13:30 Kuta Beach, Legian, 14:00 Sanur Beach; 11:00 Tulamben; 12:00 Candi Desa, Padangbai, Ubud. The time is to be advised for other locations in Bali. If you are making your own way to the port please let us know at least 2 weeks prior to the cruise. Boarding time for “own transport” guests is 1.00-2.00pm. Transfer times: We will meet all flights and bring you straight to the vessel on cruise departure day or from your hotel by approx.12 noon. Guests are recommended to arrive one day prior, to enjoy the beauty of the surrounding area and to be sure you can make your cruise connection. Why not visit the Three Colour Lakes in the craters of Keli Mutu volcano! Transfers from/to the airport and within Manado City are free of charge. Transfer times: We will coordinate your arrival and collect you from the airport or your hotel and bring you direct to the vessel. There are several reasonable hotels in Sorong plus there are some wonderful island retreats around and about that you may wish to stay at before or after your cruise. We are happy to assist with ground transport, accommodations, resort stays/local diving and flight ticketing. Transfer times: We will coordinate with you for your arrival or departure transferring you from/to the airport or from/to your hotel within the city limits. Domestic Flights: The majority of local flights need to be booked in Indonesia. Although some airlines accept internet bookings such as Silk Air and Lion Air, many cannot be booked online with a credit card from overseas. If you would like help in booking a domestic flight, please just let us know. Guests are strongly advised to arrive at least one day prior to their cruise to avoid any delays. Non-divers are welcome on every trip, and receive 10% discount on the published cruise rates. Equipment on board: Rental is charged on a “per diving day” basis. Full rental equipment is available. Dive computers are mandatory for all divers. Please advise your rental equipment needs, including sizes, when booking. Most tanks on Mermaid 2 are 12 litre, but there are some 15-litre tanks available. Tank valves are INT fitting, and some DIN adapters are available on board. If Mermaid Liveaboard equipment is lost/damaged, the full replacement cost will be charged at the discretion of the Cruise Director. Published equipment prices are available on board.